Here at MO, we think training is important to keep our skills sharp; and training in other disciplines is one tool in our arsenal. So it goes without saying we are fans of anything that makes said training more affordable and accessible. As you probably know from our recent stories on participating in yet another 24 hour mini bike race and our very own Trizzle’s recent test of the turn-key ready-to-race 2019 Husqvarna FS 450 supermoto, we MOrons are big fans of taking advantage of the tighter confines and lower speeds of karting circuits as a way of refining one’s everyday ride craft – as well as race craft. Karting circuits are generally closer to home and the price of admission is significantly cheaper than full-size racetracks. As a matter of fact, almost any excuse to rip around a kart track on a turn-key supermoto is a legitimate one in our eyes. 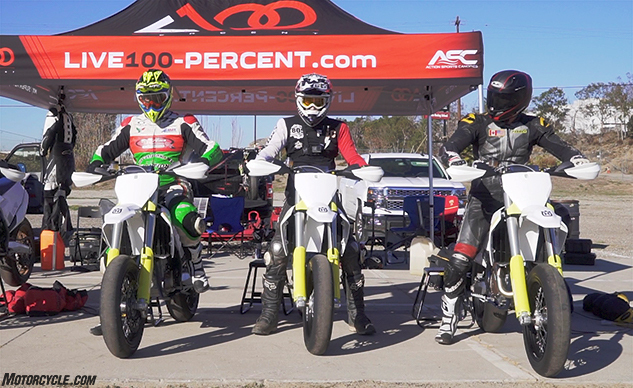 Thanks to the recent launch of Live 100% Supermoto School, a supermoto rental, riding school, and race team for hire, we didn’t need to come up with any bogus excuses to take a day away from the palatial MO offices and get our butts back down to the kart track. Live 100% utilizes a fleet of wonderfully competent Husqvarna FS 450s, and I, your humble video producer/editor, got a chance to be in front of the camera for a change to give the new school a shot. In the process, I got schooled by a couple of fast MotoAmerica kids, but I also learned a lot, too. Check out the video to get the full experience.